Nepal-Bangladesh bilateral relation saw a promising prospect, when, Prime Minister Sheikh Hasina offered Nepal in using Saidpur Airport, Chittagong and Mongla Port amidst the flaring tension between Nepal and India, which reached its apex during November 2015. Not only the policy makers of Nepal, even the public opinion, rendered this offer with utmost reverence which heightened aspirations, as Honorable PM made Bangladesh the first nation to offer help during the time of crisis. The development of connectivity between two nations, as proposed by the PM would create conducive environment for creating benefit for both of the nations. However, as of present, the prospect of connectivity is not receiving any significant progress, where the situation demands measures at diplomatic and political platforms, both bilaterally and multilaterally, if these two nations want to make the most out of the relation which began right with the formation of modern Bangladesh. Geographically, Nepal and Bangladesh are separated by a mere 27 kilometers long stretch, Siliguri Corridor or popularly known as Chicken’s Neck, which belongs to West Bengal, India. Apparently a small and narrow stretch, its pivotal geopolitical significance is camouflaged by the size. Not only a barrier to Bangladesh-Nepal and Bangladesh-Bhutan direct connection, it is the only connection between main land of India and the North-Eastern Indian States also known as Seven Sister states–the contiguous states of Arunachal Pradesh, Assam, Meghalaya, Manipur, Mizoram, Nagaland and Tripura. Two among them, Sikkim and Arunachal Pradesh, share border with China whereas other two suffer violent separatist movements. Other states also have severe security scenario with numerous armed groups engaged in various forms of violent movement. This fact not only amplifies the strategic importance of Chicken’s Neck but also poses an impediment to the connectivity of the region. Indian government regards this as a serious security concern where the area is regularly patrolled by Indian Army, Assam Rifles, Border Security Force (BSF) and West Bengal Police. Despite that, there is a movement of goods and people between Nepal and Bangladesh border. But some regulations such as obligation for trucks to move in a convoy of at least 25 vehicles escorted by police still impose hindrances in fostering the advent of increased connectivity. The formal proceedings of connectivity between Nepal and Bangladesh can be traced back to the Trade and Payments and Transit Agreements signed in April 1976, which was signed with a motive of promoting and strengthening the trade, transit and economic co-operation among the two nations. With the understanding of reciprocating the most favored nation (MFNs) treatment, the agreement allocated eighteen different kinds of goods including rice, tobacco, wool, cheese, etc. for export from Nepal to Bangladesh and seventeen different kinds of goods including tea, chemicals, electronics, fertilizers, etc. for export from Bangladesh to Nepal. To sum up the perspective of bilateral trade, according to the data of 2012/13, the total trade accounts for about Nrs. 4.9 Billion or Bdt. 3.6 Billion where Bangladesh is at trade deficit of Nrs. 556 Million. Similarly, six places were approved for the movement of ‘traffic-in-transit’ using any means of transport for third country trade under mutually agreed transit facilities - the ports of Mongla and Chittagong, the Bangladeshi-Indian borders at Biral, Chilhati, Benapole and Banglabandh. Despite of approval from Bangladesh, to reach Bangladesh, Nepal has to pass through Siliguri Corridor, regarding which; Indian skepticism can be arrantly justifiable. However, India has allowed road connection from Phulbari border (Indian border with Bangladesh) up toKakarvita-Panitanki (Nepal-India Border) which is just 44 km up to the Banglabandh border. Another 55 km passing has also been provided through Bagdogra and Ghosepukur. Amid the skepticism displayed by the Indian side regarding the use of their land for bilateral trade, a joint communiqué was signed during PM Sheikh Hasina’s India visit in 2010. Wherein, the article 23 of the communiqué clearly demonstrates the positive intention of Bangladesh to provide her sea ports at Mongla and Chittagong for the use of Nepal. The Prime Ministers also agreed in article 26 that Rohanpur–Singabad broad gauge railway link would be available for transit to Nepal. Nonetheless, the train service has not been implemented and most of the transportation occurs through the Phulbari-Banglabandh route by trucks. From economic point of view, transportation from train is considered second cheapest with first being that of ships. The broad gauge Rohanpur-Singabad railway linkis connected upto the Indian border near Birgunj and Biratnagar– the financial hubs of Nepal with paramount significance from administrative point of view. There are at least five railway links between India and Bangladesh, however, Rohanpur-Singabad line is most feasible if we take distance and type of line into consideration. A report published by Nepal Intermodal Transport Development Board (NITDB) in 2006found that the transportation cost per metric ton with train from Khulna up to Jogbani (near Biratnagar) was 890 Nepali Rupeeswhereas that using trucks was 2150Nrs. Similarly, the cost per metric ton from Kolkata to Jogbani by train was 920Nrs and by trucks was 1760Nrs. Comparing the distance Kolkata-Biratnagar is 600 km whereas Khulna-Biratnagar is 561 km. Khulna, being the third-largest city in Bangladesh, is very near to the port of Mongla– one of the four major ports of Ganges delta, is under-utilized. A railway link of Mongla with the national railway line of Bangladesh in Khulna is scheduled to be completed within 2018. 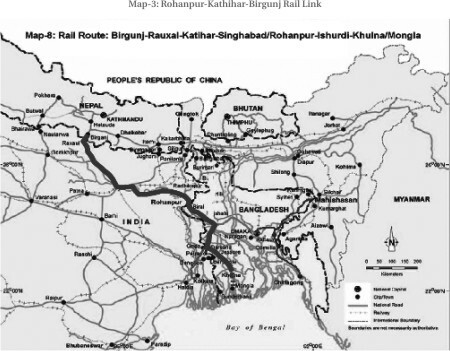 The prospect of Mongla-Khulna-Rohanpur-Katihar (India)-Biratnagar (Nepal) link can deliver win-win situation for all the involved parties, India can earn through rail charges and transit charges while Bangladesh can benefit from port charges and Nepal will benefit in its trade with and through Bangladesh. Moreover, Bangladesh has allowed the use of her Mongla port to India, Nepal and Bhutan; the port facility in which all three courtiers are keenly interested which could make the port as regional port of South Asia. As Mongla port is under-utilized, there is enough space for approaching ships and storage of cargo. It must be the reason why the cost of holding of goods in Mongla port is lower as compared to other ports of the region. Moreover, government of Bangladesh has announced a 50 percent discount on port charges for Nepal’s trade which adds to enormous advantage for Nepali side. As per present, all of Nepal’s third country traffic moves from Kolkata port where they face congestion which makes service slower in Kolkata. Recently, Vishakhapatnam Port has been declared as the second gateway port for Nepal. Regarding the available space and the type of ships that the port can handle, Vishakhapatnam provides greater advantage than that provided by the Haldiya Port in Kolkata. But the only disadvantage is regarding the added distance of 866 Km as compared to Kolkata. The addition of such distance would mean the direct hike of transportation price per metric ton of goods. Comparing Kolkata and Vishakhapatnam, per kilometre cost of transportation is 25 percent lower in Vizag. Regardless of the cost per kilometres, the addition of 886 Km as mentioned above has significant effect on total cost. On the contrary, Mongla port provides both the advantage of distance and the advantage of quick service and adequate warehouse as compared to both the Indian ports. The tension that struck the Nepal-India relation and Nepal-India border during 2015-2016, as discussed earlier, brought about problems in transportation of important supplies such as fuel. Most of the domestic airplanes were grounded due to shortage of fuel and there was even a problem for international flights. During that time, the co-operation shown by the government of Bangladesh was a prime reason that made airlifting of ATF (Aviation Turbine Fuel) to Kathmandu possible. Nepal, recently devastated by earthquake, could not transport medicines, foods and other crucial supplies and reliefs to the remote hills and mountains without airplanes and helicopters. The airlifting of ATF helped government in resuming the supplies. In addition to the effort of Bangladesh in strengthening the bilateral ties in the time of crisis, the event, also underlines the advantage that geographical vicinity provides in connectivity through air. The first bilateral Air Service Agreement (ASA) was signed between Bangladesh and Nepal in 1976 which aimed at promoting national carriers of the respective countries.The agreement decided the number of flights per week to be seven and number of seats to be limited at less than 40,000 per year for each side. In 2005 another MOU on ASA was signed, which dictates, besides National carrier, a permission for private airplanes to make flights with number of seats increased up to 3500 a week. Similarly, Chittagong airport was allowed to be used by Nepali airplanes whereas a second international airport, if built in Nepal, would be allowed for Bangladeshi airplanes. The number of Bangladeshi tourists visiting foreign countries has been reported to be about a million every year. Most of them visit India, Malaysia and Thailand and the number of tourists visiting Nepal has an increasing trend (Although it saw a sharp fall in 2015 due to earthquake). But the tourists visiting Bangladesh is only about one hundred thousand in a year and very few Nepalese visit Bangladesh for tourism purpose. If enough promotion is done in both the countries, it is certain that each of them can attract tourists, which would demand an increase in bilateral aviation and connectivity through air. Moreover, both of the countries have even agreed upon a tourist package which says ‘from tallest peak to the longest beach’ to capitalize the potentiality this region carries. The advent of SAARC (South Asian Association for Regional Co-operation) marked a very promising future for the region but to the dismay, as a regional co-operation it is performing poorly as compared to other co-operations. Trade among countries in SAARC is about five percent of the total trade of the region. When compared with trade in ASEAN (Association of South East Asian Nations), which is twenty-five percent of their total trade, it is remarkably small. Although the advent of SAARC made it possible for signing of SAPTA (South Asian Preferential Trade Agreement) in 1995 and SAFTA (South Asian Free Trade Area) in 2004. The evident lack of effectiveness of SAARC can be an effect of political tension and mistrust between two of the biggest economies of SAARC- India and Pakistan. It has been a hurdle for the progress of this region in economic realm and also regarding connectivity. A new initiation of BBIN (Co-operation between Bangladesh, Bhutan, India and Nepal) provides some positive pragmatic views for the future of this region. For instance, the signing of Motor Vehicles Agreement (MVA) which was the first achievement of BBIN initiative. It was signed on 15 June 2015 in Thimpu. Its main objective was to make the transfer of goods, passengers and vehicles across the BBIN region more convenient. The agreement will permit the vehicles to enter each other’s territory which disregards the need of transshipment of goods from one country’s truck to another at the border. Thus it can save both time and money. This is an example of how initiations at multilateral levels benefit connectivity between two nations and co-operations such as this provides optimistic ground for development of connectivity between Nepal and Bangladesh. The development of connectivity between Nepal and Bangladesh can be beneficial for both the nations in various dimensions. Although Bangladesh is a major trade partner of China in South Asia, the transport options are either costly air shipments or long sea routes. China targets to construct railway from Xigatse up to Kerung which is just twenty-five kilometers away from Nepali border at Rasuwa. Railway lines have already been constructed from Central China up to Xigatse and the construction up to Kerung is projected to be completed within 2020. The completion of the project would provide a convenient and cheap transportation solution between Nepal and China. With a railway connection between Nepal and Bangladesh, and Nepal and China, a land connection between China and Bangladesh seems to be possible. Nepal has the most convenient passages between Tibet and Indian subcontinent. If political agreement can be settled upon, Bangladesh can benefit very highly from such connections. On the other hand, Nepal can find a gateway to South East Asia through Bangladesh. ASEAN countries have huge economy with just the intra-ASEAN trade to be worth 606.8 billion USD in 2014 Nepal can find initiation of development of her trade with these ASEAN countries. There is a potentiality of trade of numerous goods that can find suitable markets in South East Asia. South East Asian nations such as Malaysia have been a destination to large number of Nepali migrant workers. Convenient connection between Nepal and Bangladesh would benefit them directly and indirectly. Similarly, Nepal can also benefit from development of tourism that can be made conducive with an improved connectivity. https://eclecticnortheast.in/bangladesh-allows-india-nepal-bhutan-use-mongla-port/Despite of undeniable benefits to both the nations, there are barriers that have been significant in development of connectivity. Bangladesh, for instance, was reluctant in providing traffic transit to India and some even see this as a threat to sovereignty of Bangladesh. Although a sign of optimism has been generated with agreement between Bangladesh and India in 2015. Although, Khaleda Zia regime was always against transit right to India, an agreement was reached. Although Bangladesh can grant transit right to India, for the access of Nepal and Bhutan to Bangladesh Ports demands agreements from Indian government as the transportation requires transit in India. In order to achieve that, a multilateral rail transport agreement would be needed to make railway standards compatible and to make movement smooth across the border. Although there are impediments to the prospect of connectivity between these two nations, political and diplomatic measures have been seen to be effective for alleviation of such problems. The measures can be of bilateral or multilateral in nature. Multilateral measures such as that of BBIN MVA provides a propitious prospect where both of these nations can find benefits, mutually, through development of connectivity in various dimensions. Nepal has been in support of Bangladesh from the time when Bangladesh was formed and Bangladesh has also been very supportive in every crisis that Nepal faces. An improved connectivity between these nations certainly demonstrates a promising prospect.